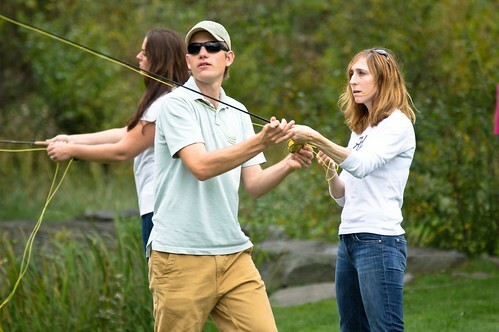 Fly Fishing was never on my radar screen until I moved to Vermont and started working for Orvis in the mid 1990s. I worked for the company for four years and learned what an “angler” was (I really had no idea), that fishing poles were actually “rods,” and that “wading pant” was not the correct term for those funny water pants. They are just called “waders.” And I was surprised to learn that an office discussion about “nymphs” was not even remotely suggestive. I also learned that the target audience of the typical fly-fisher was pretty much the polar opposite of me. A few years later, I ended up marrying a fly-fishing addict—one who works at Orvis and has the sport so ingrained in his being that when he isn’t actually fishing, he thinks about it all day, and then comes home to write about how others can learn the sport at night and on weekends. Can you imagine? Before we were married, I was asked, “Are you sure you can live with this? This is just how I am.” so I knew what I was getting into before taking the next step. But I still did not want to learn to fish. “Nah, not for me,” I said whenever I was asked if I wanted to try. When my husband would fish, if I came along, I would read or hike. I never actually picked up a fly rod. This fact seemed to stun most people I know, but I was actually secretly proud of my steadfast resistance over the last decade. Recently, though, I had a change of heart. 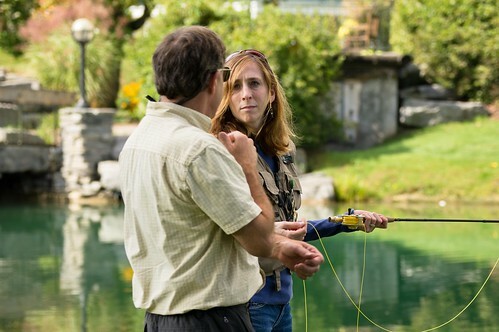 Robin receives casting tips from her instructor at the Orvis Manchester Fly-Fishing School. Earlier this year, I felt I was in a rut. I needed to get out of my comfort zone and learn something new. I set a goal for myself to try a few activities I have always assumed I would hate. These activities were primarily centered on fitness. But one day this spring, when my husband broached the subject of whether our son was ready to learn to fly-fish, the topic of me finally learning as well resurfaced. Instead of replying with my typical “Nah, not for me,” I actually thought about the learn-something-new goal I had set earlier in the year. I thought about the activities I didn’t think I would ever like, but which I now love, and realized this just might be the right time to give in to my stubbornness and give fly fishing a try. A few months later, I took the next step. Because women always need a partner-in-crime, I enlisted my friend Kiernan to take the Orvis Manchester Fly-Fishing School with me for two full days last month. The Verdict? I had a blast! This was against my expectations, as you can imagine. I had many preconceived notions of what fly fishing would be like from watching from afar all these years. I had expected that the class would be filled with all men (aside from us), and that I would feel out of place. This was not so at all—the class was actually half women and half men. I thought the instructors would be kind of boring and stuffy and serious, and that laughing, not-very-serious women might be judged as “not authentic enough” for the sport. Again, I found the opposite was true. Those people who teach the sport love it; they want you to do the same. Now that the vest is on, it’s time to talk less about casting and more about fishing. I expected I would be terrible at casting. What I learned? It takes practice, and basically it doesn’t matter what your cast looks like. The fish do not care if your cast looks like it came out of “A River Runs Through It.” What is important is that you cast so you can get the fly where you want it to go. I had expected that hanging out in the water waiting, waiting, waiting for the fish would be boring. Actually, I was incorrect there, too. Time went quickly as I was thinking of some key things: keeping myself from slipping and falling, not spooking fish, what fly I was using, if I had tied the right knot on the end of the line, not hooking trees. You may not look like you are doing anything out there, but I realized there is a lot of active brain power being used. I really enjoyed learning to cast. There are a few rules for success, and once you get the hang of it, it’s easy to tell the difference between a bad cast and a good one. I felt the same satisfaction when getting the line where I wanted it to go, as I would if I were aiming for any target, like a soccer ball in a net. For any competitive, driven person, it’s really cool to see the gradual improvement with every new cast. There were other parts I liked, as well. I liked that we could look around by the stream and see what the fish were eating and try to mimic those insects with the flies. I enjoyed trying to look at the water and anticipate where a fish might be. I enjoyed wading in the water, taking in the scenery on a beautiful day. Most of all, I loved spending the day like this on the water with a great friend. 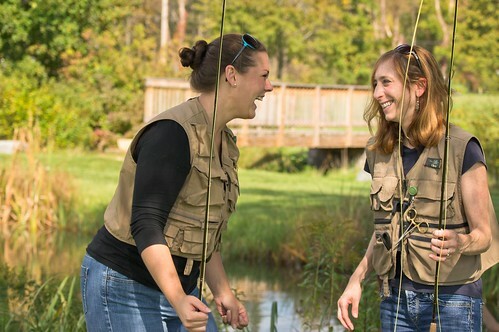 Robin and her partner in crime, Kiernan, enjoy a pond-side laugh. Did I think I would catch a fish? Never. Actually, catching a fish never even crossed my mind. I was having too much fun doing everything else. I was told by the instructors that this will change after my first catch, but I’m not so sure. So, what didn’t I really get into? Well, honestly, I didn’t really want to think about the nitty-gritty details. I know fly fishermen love to talk about which rod specifically they need to use, which reel, which leader and tippet, sizes, shapes, lengths….to me, I say, “Whatever.” All the knots, and all the different flies? I don’t think I have the patience to learn any more than two or three knots and do not really want to think about all the fly choices or learning all the names of each. I would just want someone to give me the right rod, set it up for me, tell me which five flies might do the trick, and send me on my way. And from what I learned from this experience, that’s okay, too. I came to realize we can embrace the details if we like, or we take the parts of the sport that are enjoyable to us and make it our own. I’m not sure what my next step is in the learning process, but I just ordered my waders and boots, borrowed a rod from the basement, and started casting practice in the yard. My new fishing license is only valid for a few more weeks—I have some work to do! Robin Kadet is a former Orvis employee and is married to Tom Rosenbauer.